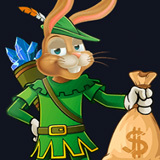 The legendary Rabbit Hood is in an enchanted forest on a quest for jewels this month at Jackpot Capital Casino. Frequent players are winning weekly bonuses up to $500 each and even occasional players are winning weekly random draws during the $100,000 Rabbit Hood casino bonus event. Jackpot Capital Casino has hundreds of real money online casino games from Realtime Gaming. Players earn points any time they play any of them and they’re ranked on a scoreboard. Every week the popular online casino will give $15,000 in casino bonuses to their top 300 point scorers. There will also be weekly random draws for another $5000 in bonuses that any player can win. Players compete against each other for top weekly bonuses -- up to $500 each. Earn frequent player points when you play online casino games on your desktop or laptop computer or in the mobile casino on your smartphone or tablet. Jackpot Capital Casino offers hundreds of games from Realtime Gaming (RTG). The newest is Secret Symbol, an Aztec-themed slot with a free spins feature where wins are multiplied up to 20X. Introductory bonuses will be available when the festive Popinata slot is unveiled later this month.